Mer & Jackie's 5 Corners Supper Club gets its name from the owners and the fact that it is at the intersection of 5 roads. It is in the country outside Appleton towards Freedom off Ballard Road. We met our friends there and all got there about the same time, so we got to the bar and ordered up a round of Brandy Old Fashioned Sweets. The drinks were your typical old fashioned, but it wasn't of their own mix. My second old fashioned was mixed a little different than the first so the flavor wasn't consistent. We enjoyed some conversation and after 15 minutes, a waitress appeared at our bar table to take our order. 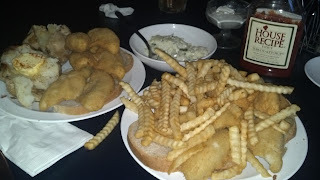 I got the 1 1/2 perch dinner with american fries as my potato, and some of my friends got some variation of the seafood platter (haddock, shrimp, cod, etc. ), all of which included the salad bar. After a short wait our waitress told us our table was ready at tables 2 and 3 (put together) so we headed to the dining room. The place wasn't really busy so there was plenty of space at the bar and open tables in the dining room. We headed for the salad bar, and I wasn't overly impressed at the selection. Basic trimmings of salad, liver pate, cheese spreads, pasta salads, and soups. The soup was cream of carrot but more tasted like a cream of chicken. We had a fresh loaf of homemade bread waiting at our table that was delicious. Our food arrived and my 1 1/2 perch platter had 9 pieces of perch which is about what I was expecting. Cole Slaw was on the salad bar so my only side was my american fries and I was given two containers of their homemade tartar sauce. The breading on the perch was a little thick and fried to various tones of brown. I forgot to ask how they prepare their perch because it doesn't look like perch you get at most places, but it was really good. The breading was crunchy and the fish was cooked perfectly. The side of american fries was excellent and enjoyed it very much. The homemade tartar sauce was enjoyable and had a good kick of pickle juice in it. We capped the night with after dinner drinks of Brandy Alexaners and Grasshoppers at the bar. 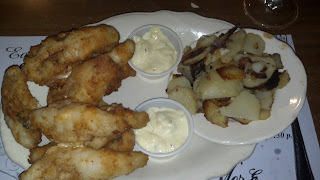 All in all they could improve on their classic Wisconsin Fish Fry experience, and even on their supper club experience, but the food is good and worth a visit. Classic Wisconsin Fish Fry Scale: 4.5 points out of 5, definitely a classic Wisconsin fish fry. Capitol Centre is located right off Richmond St on Capitol Dr in Appleton and is a little hidden. Getting there at 6:45pm on a Friday night during peak fish fry time, I thought we'd have to wait, especially with 7 in our party, but the parking lot was sparse and tables were plenty inside. Looks like it has all pub style seating, it is a bar & grill after all. I ordered myself a Brandy Old Fashioned Sweet and to my surprise it was hand-muddled. It is hard to find a good hand-muddled Brandy Old Fashioned, so our fish fry was off to a good start. I ordered the perch platter with a side of criss cuts w/ sour cream. It was not that busy so I wasn't sure what to expect, as much as I don't like waiting for a table, it is the places you have to wait have the best fish fry. We got our food in a timely fashion and our waitress presented me a plate of golden fried fish and criss-cut fries and it looked delicious. The fish had a thicker coat of breading and it was slightly greasy, but when I took a bite it tasted crispy and good. The fries were cooked nearly perfect, the cole slaw was creamy and pretty good. The meal came with a light rye bread, but no raw onion as I would have expected. This place is great for a quick Friday night fish fry with some good fish. 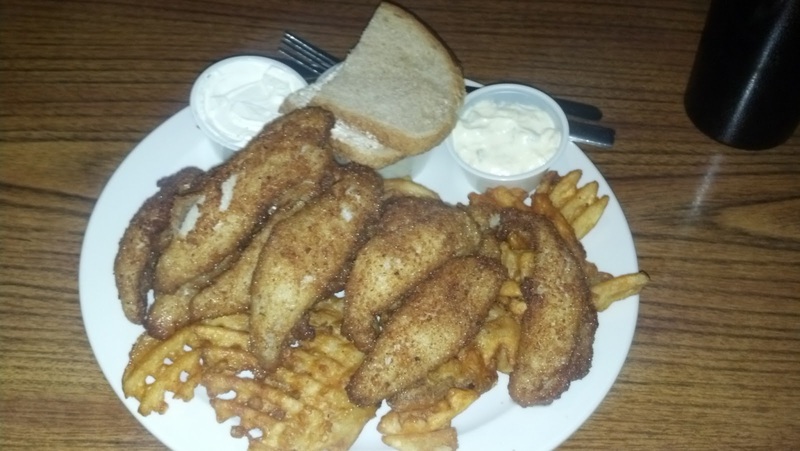 And it scores a 4.5 out of 5 on the Classic Wisconsin Fish Fry which I loved. If you're looking to try someplace new that might not have known existed, give Capitol Centre Bar & Grill a try. 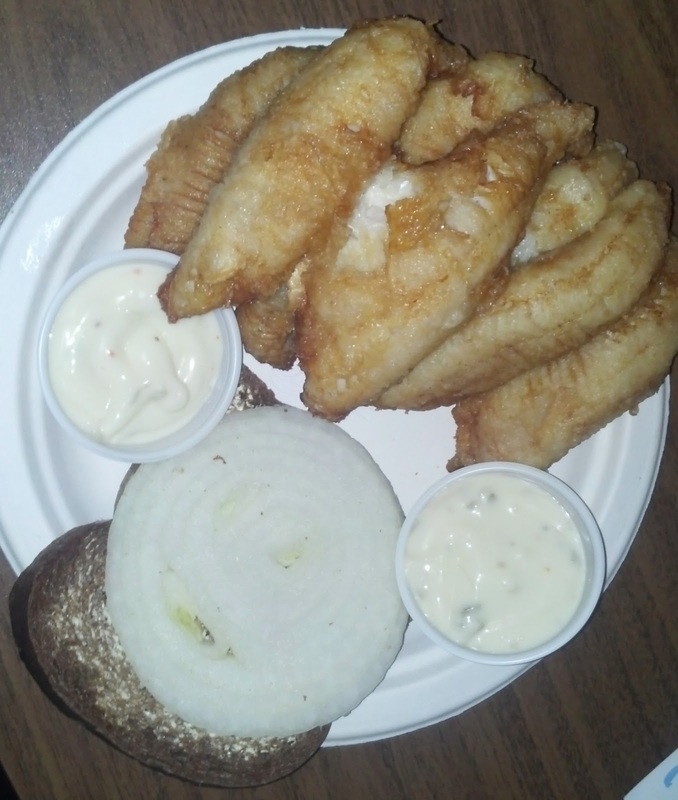 Total: 4 points out of 5, nearly a classic Wisconsin fish fry experience, if they add raw onion it would be about as close as you can be. The Redwood Inn is hailed as a local fish fry establishment that everyone seems to know of when you ask if they've been there. It's a little out of the way but we made the trip to try out their fish fry. We wanted to go to an early movie so we thought we would beat the rush and get their by 4:30pm, and needless to say many others try to beat the rush too. When you walk in you simply grab a number, no putting your name in, they just go in order of the numbers. When we sat down at the bar we were #79 and we saw #50 still waiting to be seated, so we knew it would be a long wait, but a long wait is a sign of great food. There is a large bar area for drinks and conversation, and this place has the most Green Bay Packer memorabilia I've ever seen, complete will full mannequins with uniforms and helmets. Our bartender Judy was great and provided prompt service. While the brandy old fashioned's were not muddled, they did make their own mix so they take some pride in their cocktails. After about 30 minutes our order was taken at the bar, but that didn't mean we were sitting anytime soon, just getting our order queued up. We decided to get cheese curds and mushrooms as appetizers at the bar and both were pretty good. After about an hour, a waitress stopped by and said our table was ready. We grabbed our coats and turned around and she was gone, we weren't sure where we were supposed to go. Everyone seems to be in such a rush running around to help multiple people at the same time, but she found us again and showed us to our table. After a brief wait at the table, our food appeared from another waitress, using a baking sheet to carry out the plates. She dropped our food off which included both our perch platters and a bowl of cole slaw for the table. We had to flag down another waitress to get some water. Instead of having dedicated waitresses they have people who sit people, people who deliver food, people who bus tables, and people who check on tables to see if they need anything and it seems a bit chaotic. We both got the perch platter and I got a side of fries and my friend got a side of baked potato. My fish was served with light rye bread on the bottom, stacked with 3 filets of perch and covered with french fries. My friend had a similar presentation but with 2 baked potatoes on the side, yes that's right, 2 good size baked potatoes as a side, they are generous with their potatoes. The perch was good but not as good as everyone seems to rave about. The breading was light enough to not overtake the perch flavor. The fries were your basic frozen french fries but at least they were crispy. The cole slaw was creamy and pretty good. They do make their own tartar sauce so that was good to hear at least. Looking towards the bar as we were eating it was standing room only, I can't imagine what the wait would be at that time. The service at the Redwood Inn leaves something to be desired but overall the food was good but I can't say I'll be back anytime soon to wait an hour for the food. There are plenty of other fish fry establishments to check out. When a friend told me about an old fashioned in a bottle, I didn't believe him. 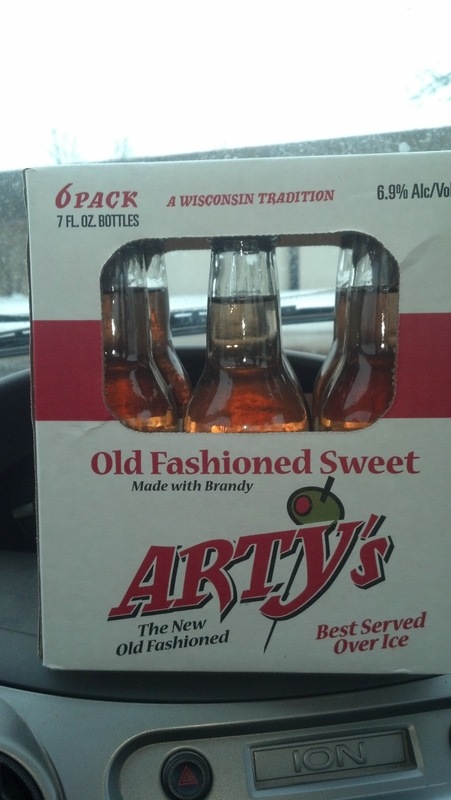 He said stop at your local Copp's food in the Fox Valley and there you'll find the new/old fashioned. So I did. I must say I enjoyed my first taste of Arty's brandy old fashioned sweet. You can opt for a whiskey old fashioned sour but that wouldn't be talked about at www.brandyoldfashioned.com, now would it. What I like about it is that each bottle you open is consistent in how its made, you can end up quite a variance when a bartender pours it free-hand. It was quick and easy to open a bottle and enjoy a brandy old fashioned sweet on the spot. But then again, maybe you can have too much of a good thing, or 6? I loved the flavor and think they did an awesome job with a Wisconsin classic. So catch a buzz with Arty's. Total: 3 points out of 5, barely a classic Wisconsin fish fry experience. Sure, Maricque's only gets 3 out of 5 on the classic Wisconsin fish fry scale, but part of me just wants to say they offer the classic experience from the dining room to the food experience, and you'll see why. 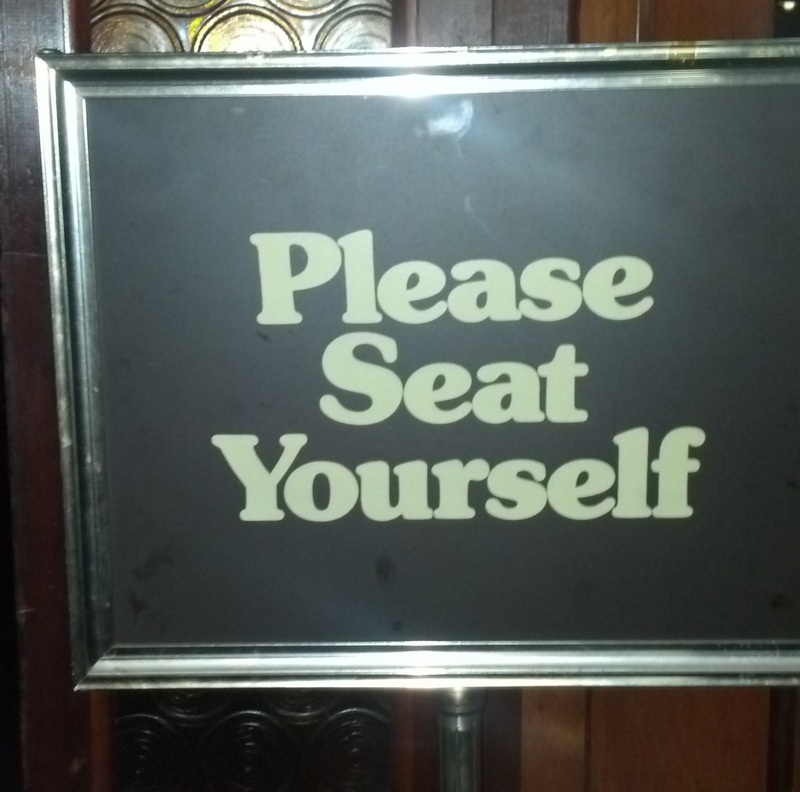 We came in and there was a bar area with plenty of pub style seating and a sit down dining room. 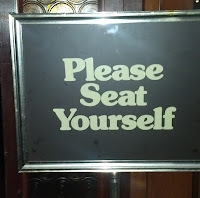 There were 4 of us and I said I would register our party with the hostess, but I find a line of people waiting to get in the dining room with a "Please Seat Yourself" sign. Not typical, but they are busy enough serving drinks and food that there is no room for a hostess. So we got our drinks and I of course got a brandy old fashioned sweet. It wasn't muddled, not many places are these days, and the flavor was ok. I wasn't sure if they used a standard mix or they made there own. Then we took our place in line. 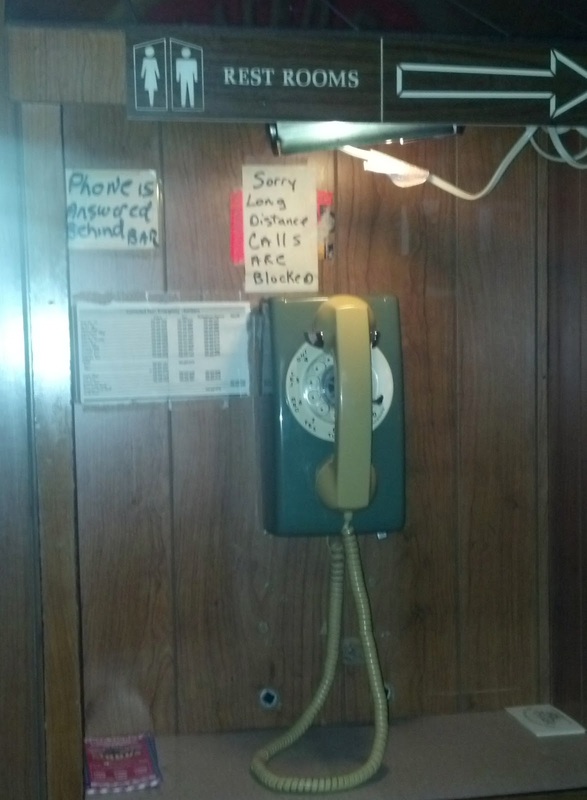 While waiting in line and enjoying our drinks and conversation, we look over to see an old fashioned phone still on the wall. I should have picked it up to see if it really worked, haven't seen one of those in years, much less one that is supposedly still operational. I wonder how often it actually gets used. From the time we got there to finally getting a table it was about 1 hour of waiting. The dining room really takes a while to turn over it seemed. We saw people playing cards at their table, not sure if they were waiting for food or done with their meal. One rule of any supper club or fish fry establishment is that once you are done with your meal you socialize at the bar and not at your table, especially when there are people waiting. This is the job of the waitress to move people along. There were some pub tables that opened up in the bar area but regardless of where people were in line, the closest person to the table gets it, so we made our move for the next pub table that opened up and finally sat down. 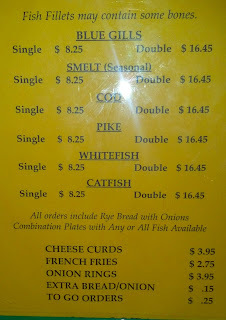 The menus are just what you see below, nothing fancy or complicated all fish of various kinds, and all fried. The bluegill was tempting but I heard good things about the perch and just had to try it; we all got the perch. 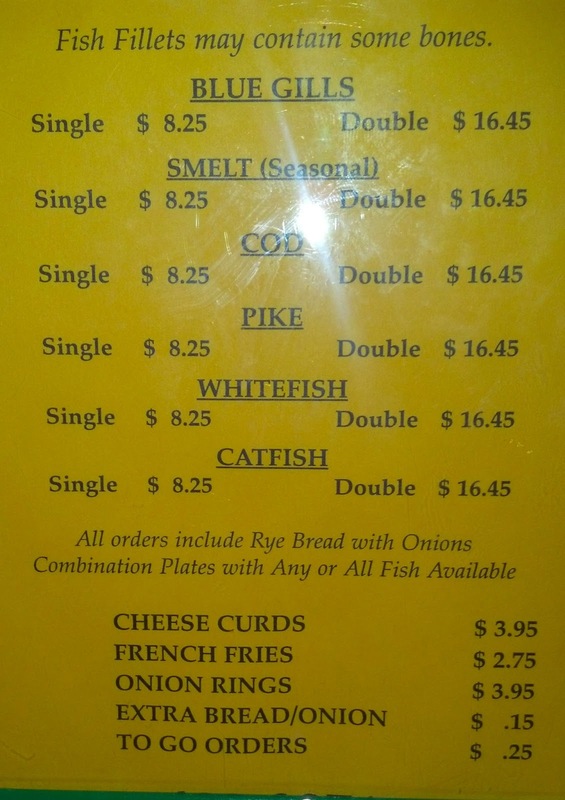 You can see the prices for the various portion sizes, and keep in mind that it only comes with the fish and rye bread with raw onion, a side is extra and there is no cole slaw available. I got a single (4) which comes with 4 butterflies of perch. My friends got some variation of the portion sizes and we got french fries, cheese curds, and onion rings for the table. When the food came there was a mound of perch on my plate and I could not wait to dig in. I love that they automatically give 2 servings of tartar sauce, most places skimp and you have to ask for more. And the rye bread with raw onion came with a thick slab of onion slice. The perch is like none other that I've had before. It wasn't crispy like I'm used to and the breading was about perfect, and it was deliciuos. You could see some of the fish through the breading, which means the breading is the perfect amount. The fish was cooked excellent and had some good moisture to it and tasted great with the generous sides of tartar. We took plenty of the perch home because we all over-ordered but there is nothing better than left over perch the next morning. So you see why I have to call this a classic fish fry experience, even though it doesn't meet the official criteria. This place has been doing this for the past 20 or 30 years and they pack the place every Friday night so they must be doing something right. 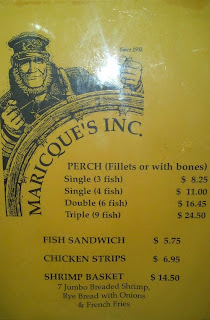 If you can handle the wait and are able to seat yourself, give Maricque's a try and I promise you won't be disappointed if you like a good fish fry.